After Bentley the Italian Greyhound lost his first family in a divorce, he found a new life as an emotional support dog for a very appreciative veteran. They’ve only been together since November, but veteran Darren Davis-Kandler already can’t imagine his life without his little Italian Greyhound, Bentley. “He’s wonderful. He’s literally what the doctor ordered for me,” he says. Dealing with a dual diagnosis of PTSD and Parkinson’s after serving in the military for eight years, Davis-Kandler was intrigued when his therapist suggested he would benefit from an emotional support dog — but he worried that some of the proposed breeds would be too large for his needs. “I can’t handle a bigger dog because of my condition,” he explains. After extensively researching the topic of companion animals as emotional support, Davis-Kandler decided that an Italian Greyhound would be the perfect fit for him. “They’re very loyal, and they’re very loving,” he says, adding that Bentley has lived up to his breed’s reputation from the moment the two met. The bond was instantaneous, but finding Bentley sure wasn’t. Davis-Kandler was initially working with an organization that purchases emotional support and assistance animals for veterans, but his choice of breed proved to be expensive for the program. Then, he connected with Companions for Heroes (C4H), a non-profit that matches rescue and shelter pets with veterans, military personnel, and first responders who are dealing with PTSD and other issues. C4H matches heroes with pets free of charge and worked with Italian Greyhound Rescue Gulf Coast (IGRGC) to bring Davis-Kandler and Bentley together. “It was a long process. It took about six to eight months to do this,” Davis-Kandler explains. The situation was complicated by the fact that Davis-Kandler was out of the country during part of the adoption process. He divides his time between Florida and Germany, spending half the year in each location. This meant that after completing a home visit of his place in Miami, he flew to Germany and Skyped with folks from the rescue, showing them the apartment he lives in and outdoor amenities Bentley would be using. Once all the paperwork was complete, C4H took care of the adoption fee and even provided Davis-Kandler with gift certificates to cover some supplies for Bentley. “I thought it was amazing,” he says, adding that IGRGC is a great organization as well and were very helpful in matching him with Bentley. Bentley is loving his role as constant companion. Before he met Davis-Kandler, Bentley found himself all alone — as unwanted as a dog could be. According to Davis-Kandler, young Bentley once belonged to a couple who broke up. When the relationship ended, neither person took Bentley with them. “He was the male’s dog. [The male] left and left him with his girlfriend, and she couldn’t take care of him, or didn’t have time. She put him up for adoption,” he explains. For Bentley, being matched with Davis-Kandler meant a second chance for a forever home, but it also meant he had a lot to get used to. According to his human, Bentley (like many Italian Greyhounds) can be easily startled by unfamiliar noises and is prone to freezing when he’s feeling afraid. “I think whoever owned him before might have lived in the country, because he was not accustomed to the sounds of the city,” says Davis-Kandler, who notes that that the traffic, boats, trains, and planes around Miami can be a bit much for Bentley at times. Davis-Kandler says he’s just returning the favor to the dog whose presence has made a big difference in his life. Bentley is not trained for assistance tasks yet, but he’s already proved to be invaluable to his human. “Once I had him he just kind of reminded me that I can take care of someone else,” says Davis-Kandler, who says that the added responsibility has been good for him and added a lot of structure to his days. Davis-Kandler says Bentley gives him a reason to get up every day. Together, Davis-Kandler and Bentley are taking on the world and leaning on each other when either feels overwhelmed. The veteran says he can’t imagine how Bentley’s first family could have given him up, but he’s happy they did. 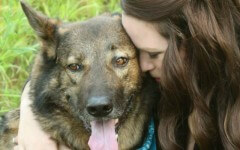 By giving Bentley the loving home he always deserved, Davis-Kandler is also getting his life back. “This dog is so amazing,” he says, adding that he would encourage other veterans to seek out adoptable companion animals.